Monday's technology headlines were hogged by the release of Intel's Core i7 3960X Extreme processor. Blazingly fast in most of our benchmarks, the new Sandy Bridge-E chip's $999 (£750) asking price puts it firmly out of the reach of most people, and that's without factoring in the supporting motherboard, X79, and four-DIMM memory support. And there's not a lot in it, clearly. 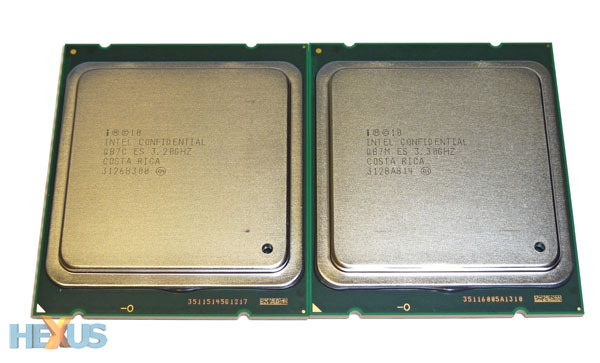 Core i7 3930K is also a six-core, 12-threaded chip whose die contains two inactive cores. But there have to be cuts somewhere for product segmentation purposes, and these happen in a couple of ways. 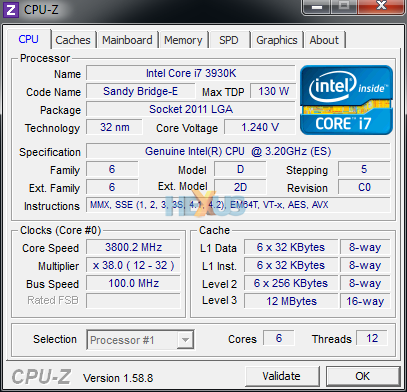 First off, 3930K is clocked ever-so-slightly lower, at 3.2GHz to 'X's 3.3GHz. Secondly, the lower-rung chip has a little less last-level cache (LLC) than its bigger brother, down from 15MB to 12MB. Understand, too, that supporting the 3930K's case for purchase is the fact that both SNB-E chips share the same Turbo Boost 2 .0 function - up to six bins, depending upon load - and a multiplier-unlocked status, enabling the enthusiast to jack-up the ratio for easy-as-pie overclocking. It's this unlocked status that makes a mockery of the default specifications, as far as tinkerers are concerned, because Intel's shipping 3.20GHz speed is rendered practically irrelevant by hiking up the multiplier to, say, 40x. Core i7 3930K on the left. Can you guess the one on the right? Aside from how Intel programs these chips at the fabs, the biggest differentiator is price, as the Core i7 3930K is significantly cheaper. $564 (£450-plus) is certainly no bargain, granted, yet, as we've explained, there's not much to choose between the two Sandy Bridge-E processors from a performance perspective. For those who have their heart (and wallets) set on Intel's finest consumer platform, which is inherently expensive, it makes a lot of sense to go for the Core i7 3930K for all but the ludicrously rich, especially as the $445 (£300) saving can be nicely invested in other parts of the system. Load up one or two cores and the chip jumps to 3.8GHz. Nice! A little less LLC and a teeny-weeny drop in speed are the only minor performance compromises the Core i7 3930K is faced with. With that in mind, right now, it's the only Core i7 3000-series processor worth considering for the vast majority of readers. That's a lofty claim given that we've not discussed benchmarks. Without further ado, let's get to them.